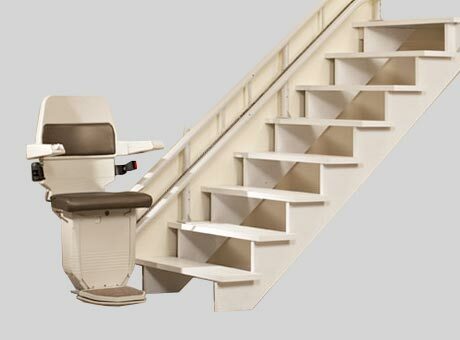 BS 101 Stairlift - Manchester Stairlifts - High quality stairlifts in the Manchester area. The BS101’s slim carriage and rail also makes it suitable for narrower staircases and when folded away leaves plenty of room for other stair users. Operating the BS101 couldn’t be simpler with push button controls or optional joystick it glides gently up or down stairs with ease and the swivel seat makes getting on and off the stairlift easy and safe. The stairlift’s battery powered motor also ensures a smooth gentle ride and with automatic charging from the top and bottom of the rail you can be sure it is always ready to use, even in the event of a power cut. Every BS101 carriage is thoroughly inspected and passes vigorous testing by our specially trained engineers to ensure a consistently high standard with every lift we sell. Our emphasis is not just on quality, but also on safety. A major part of our testing process involves ensuring all our safety features on the BS101 are effective and user safety is never compromised. Our BS101 rails are individually built, tested and inspected to ensure a smooth ride quality and finished using the latest, high quality, powder coating techniques.